3/9/99 Joe in photo. Cold. "Something's" shelter. These notes concern my search for evidence of Bigfoot or Sasquatch from December 1998 through November 1999. They are transcribed from handwritten journals. Almost all are concerned with field work in an area of the north Oregon Cascades centered on a point approximately 90 miles SSE of Portland, Oregon. With few exceptions, all field work has been done in the Mount Hood National Forest's Clackamas River Ranger District (click here for a hand-drawn Clackamas map). Pretty much what I wrote is what you will read. To illustrate original handwritten text, some of the notes have been scanned. Please refer to the Index. You might want to compare them to the typed version. Joe Hector Beelart, Jr. is 54 years old. He lives in West Linn, Oregon, about 15 miles south of Portland. West Linn is just across the Willamette River from Oregon City, the end of the Oregon Trail. He drives pick-ups and drinks beer. What you are invited to read are those notes from December 16, 1998 to November 25, 1999. Selected additional field notes from 2000-2002 will be added soon. These pages were created by George B. McAdams directly from Joe's notes. You will find no Bigfoot body, bones or photographs in the notes. What Joe and his primary partners, Trapper Steve Kiley and Cliff Olson look for are: "Things that are out of place, things that aren't quite right, the little things." (Trapper Steve quote). Mainly what you will read is: go up the hill, get some exercise, maybe see or hear something out of the ordinary, go home. That's it. Don't expect anything more. The reader will also notice that there are no theories, summaries, conclusions or speculations noted. That does not mean that the days afield were random. Quite the contrary. 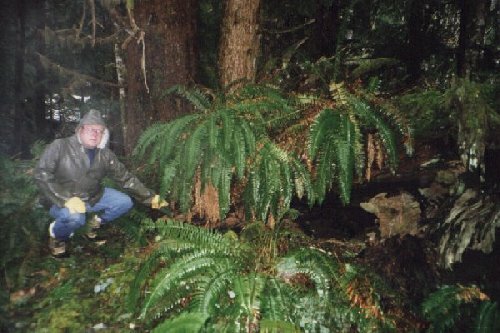 Joe has been working on his "Standard Sasquatch Area" theory for some years. Field work was based around that theory. From now on, the theory will be co-written by Trapper Steve Kiley. A book might come out of this and the listed issues will be addressed. All of this writing, pictures and maps are ©, Copyright Joseph Hector Beelart, Jr. 2000-2002. All rights reserved. Joseph Hector Beelart, Jr. unless otherwise noted.